House of Propellers presents, in collaboration with curator Cecilia Brunson, the first UK solo exhibition of notable Guggenheim Fellowship artist Cristóbal Lehyt. Through a variety of media including drawings, photographs, video and sculpture, Cristóbal Lehyt’s installation presents a meditation on the tropes and stereotypes of place. Lehyt grew up under a backdrop of South American social politics of the 80s and his work addresses questions of how personal and subjective feelings are interconnected with cultural influences. For this exhibition the artist presents a new series of sculptures. 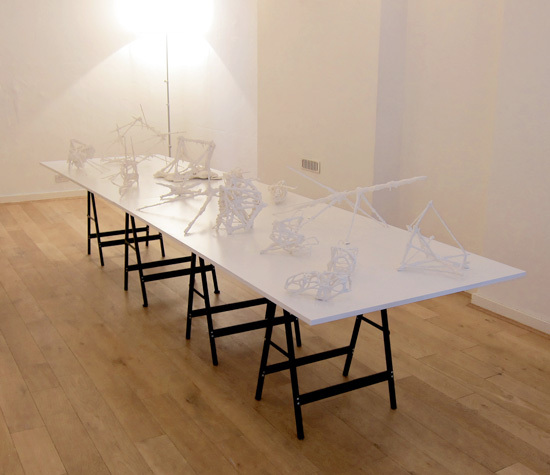 Pointedly abstract they are fabricated from low-tech materials such as string, wood, glue and wall compound. The prevalent impulse of the sculptures evokes detritus and semi-biological forms as if constructing an altered archeological consciousness. The two drawings in the exhibition shift between a readable image and the drowsy world of the unconscious. 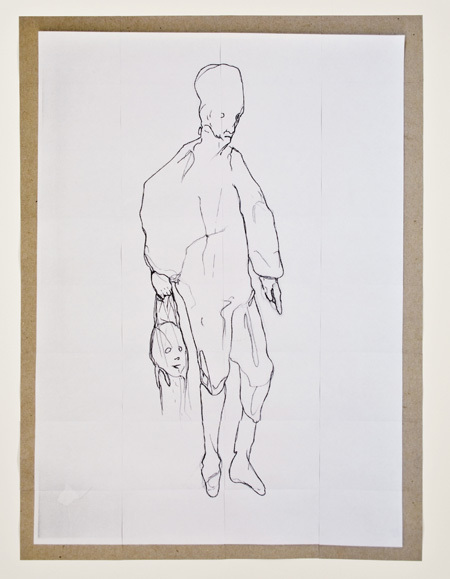 Almost ghost-ridden, these drawings are the result of a trance-like state in which the artist imagines himself to be somebody else. Yet the internal source material for the imagery is generated from a social political subconscious state inextricably connected to the artist. Cristóbal Lehyt (b. 1973), lives and works in New York. His solo exhibitions include UAG/Room Gallery, UC Irvine; Künstlerhaus Stuttgart; and Fundación Telefónica, Chile. Group exhibitions include the Mercosur Biennial (2009); New Ghost Entertainment—Entitled, Or Gallery and Kunsthaus Dresden (2006); When Artists Say We, Artists Space (2006); Metaphysics of Youth, Fuori Uso (2006); the Shanghai Biennale (2004); The Freedom Salon, Deitch Projects (2004); The American Effect, Whitney Museum of American Art (2003); Freewaves Latin America, MoCA Los Angeles (2002), as well as exhibitions in Santiago, Bogotá, Caracas, Mexico City, Berlin, Vienna, Beijing and Rio de Janeiro. He has received the Art Forum Fellowship, Harvard University and the John Simon Guggenheim Memorial Foundation Fellowship. (January–March, 2010). This exhibition has been possible thanks to the use of their studios. The sculptures for the exhibition were a co–production between the artist and Alessandra Pohlmann. has worked in New York and Latin America. Her career began in 1991 in New York at the age of nineteen. For ten years she built a collection of Latin American art with the Edwards family. In 2001 after graduating from the Centre for Curatorial Studies at Bard College, she was appointed Coordinator of Exhibitions at The Americas Society in New York. This was followed by an invitation to be Associate Curator of Latin American Art at The Blanton Museum of Art in Austin, Texas. Because of her interest in supporting emerging artists and bringing to light the work of up-and-coming curators she founded INCUBO in Chile. This was a residency program for international curators to innovate and experiment with different formats for exhibitions, lectures and publications. She recently co-founded the AMA Fellowship, a grant that facilitates residencies abroad for Chilean artists. Her writings appear in Artforum and in numerous artist catalogues.